The most ideological members of Congress shared news stories on their Facebook pages more than twice as often as moderate legislators between Jan. 2, 2015, and July 20, 2017, according to a new Pew Research Center study that examined all official Facebook posts created by members of Congress in this period. The analysis included links to national news websites that members of Congress linked to at least 25 times overall in the time studied. Some of the outlets included in the study were linked to exclusively by Democrats or by Republicans in Congress. The most conservative Republicans shared news from these outlets almost 10 times as much as the most moderate Republicans. Among the most conservative Republicans, 11% of news links went to outlets exclusively shared by other Republicans. But among the most moderate Republicans, only 1% of news links that members shared on Facebook were to such outlets. There was little difference among Democrats in the rate of sharing news from outlets linked to exclusively by Democrats across the ideological spectrum. Overall, 5% of the news links that members of Congress shared on Facebook went to outlets linked to exclusively by Democrats or by Republicans. Among Democrats, these outlets included The Nation, Mic.com, The Root and New Republic. Among Republicans, these outlets included Breitbart, The Daily Signal, The Blaze, CNS News, Conservative Review, The Federalist and several other sites. There was a large partisan gap in how often legislators shared stories from outlets linked to by members of just one party. 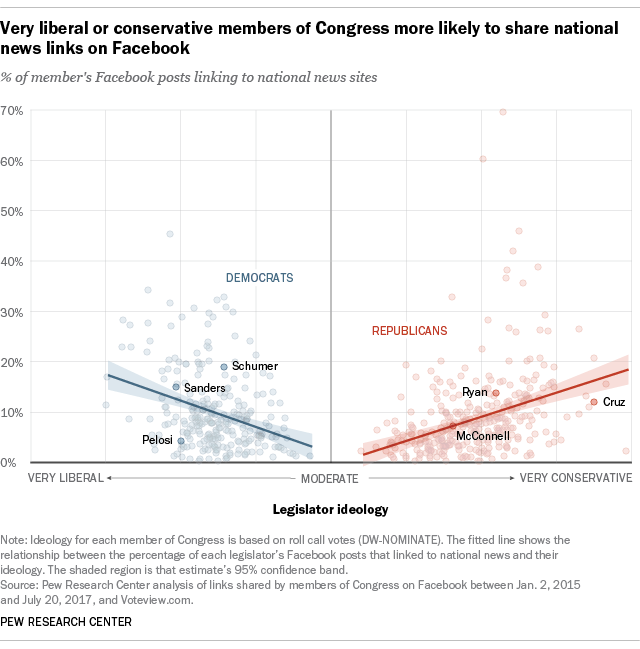 Of all national news links that Republicans in Congress posted on Facebook, 8% went to outlets cited only by other Republicans. Among Democrats, the equivalent number was just 1%. Compared with the full period studied, this partisan gap was slightly narrower once President Donald Trump took office: From Jan. 20 to July 20, 2017, 6% of Republicans’ links went to outlets exclusively shared by other Republicans. Among Democrats, the percentage of links that went to outlets shared exclusively by other Democrats was 1%, for a difference of 5 percentage points. Note: Full methodology can be found here. Patrick van Kessel is a senior data scientist at Pew Research Center. Solomon Messing is the former director of Data Labs at Pew Research Center.